What follows are a few reflections culled from a longer non-fiction piece I hope to publish in Richmond's alternative weekly, Style. Lately, I've been thinking of our nearly pornographic interest in the End Times. 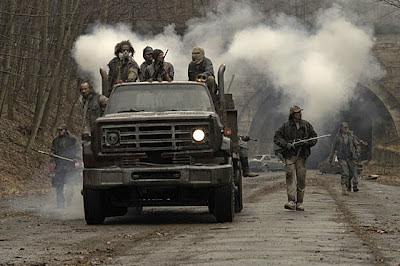 I've noticed over the years in Second Life how popular post-apocalyptic settings have been. They are also very popular in games. And while I've not read scholarship on this subject, I wonder about the continuing popularity among college kids of Cormac McCarthy's The Road in both book and film (see image above) versions. I tend to prefer stories of rebuilding and survival, such as James Howard Kunstler's "World Made By Hand" novels or the second Mad Max film The Road Warrior. These sorts of invented worlds are a minority: of contemporary doomsday TV series, it seems that only "Revolution" is about the urge to remake the world after it falls apart. So what makes these bleak futures the current staple of Hollywood, computer gaming, and so much of printed science fiction? With series such as "The Walking Dead" a sub-genre of SF has gone mainstream. It's a recent phenomenon, too. In my copy of Brave New Worlds: The Oxford Dictionary of Science Fiction, editor Jeff Prucher finds that decade gave us the earliest coinages of the terms “post-apocalyptic,” “post-catastrophe,” and “post holocaust.” Not by accident do those neologisms parallel perceptions that America had entered a gradual decline. As the Rust Belt shed jobs until Detroit very much resembled a set from “The Walking Dead,” I find it curious that instead of the positive escapism that something like “Star Trek” offers, we went dark and largely have stayed there. Even George Lucas got bleak in its trilogy of prequels, a story bleaker than even the acting of Hayden Christensen as the young Darth Vader. That's as far as I've gotten. Do post-apocalyptic settings give us freedom we lack in day-to-day life? Let us imagine a clean slate and a new start? Or are they just fun as hell, McCarthy's jet-black work excepted? Jokes aside. When you have a look at settings were the civilisation succeeded the scenarios tend to kill or desillusionate the hero. 1984, Soylent Green or Brave New World have no happy ending for the hero. Even in Bradburies Fahrenheid the hero realises that the system has won. He might have saved a book which might continue to exsist when he finds an heir, but he hasn´t changed the system. Post apokalyptic scenarios are different (and here comes the american bit again). The system has fallen and was replaced with a environment where the hero and his companions can fight for their values in a hostile surrounding. Even if they don´t survive they have stuck with the basic human values in a better society that is not dominated by technology but human virtues. That is usually emphasised in a way that the apokalypse was directed initiated or at least supported by the corrupt system (Jericho was a nice example). This new system is strongly leaning on the frontier theory and the apokalypse gives the opportunity to experience the frontier feeling without actually having to find a new frontier, because the civilized land has turned into one, because the old rules of society do not apply any more.